Another Wordpress template published today. 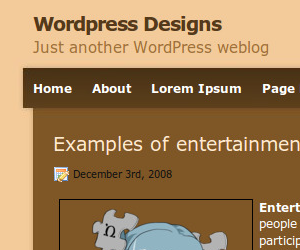 A WP version of Cream Brown template. 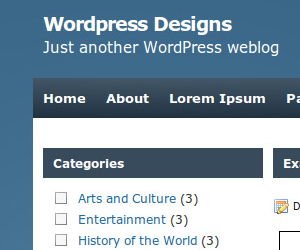 Compatible with latest Wordpress version and widgets ready. Along with xhtml/css version of Blue Business template I am releasing Wordpress version. For free download today I am releasing sleek Business Wordpress design. Widgets ready as always and you have an intro area where you can describe your business. Some plug or sales pitch would be suitable but who am I to tell you ? :) You will know what to do with it. Search for "intro" div in header.php template file and edit it to suit your needs. It is time for another pack of themes. The first one is simple but sleek and professional Blue theme called Sblue. Suitable for personal blogs and business blogs also if you add some touch to it that suits your business. Hope you like it and I would love to see what you have done with it. See it in Live Action and Download it. Script error: local_270235.xml is not writable. Please set write permissions on local_270235.xml.